So, I haven’t been out of school that long ago to know the paralyzing effect bullying can have on others. Yes, I was bullied. I’m not ashamed to admit it. Actually, I know why I was targeted; the quiet, shy brainiac always sticks out like a sore thumb. And that’d be me. But, a little hair pulling, hurling insults my way like a pebble off a Dennis the Menace slingshot is nothing compared to what kids these days have to endure. I feel for them and fear for my niece, nephew and unborn child that incessant taunting can somehow lead to this. But, if you’re anything like Nick Cannon, rapper, producer, comedian, etc., etc., you will help Stomp Out Bullying. Nick is working with the non-profit org that educates about the effects of bullying by auctioning himself off. How generous!!! Winners of the auction get the chance to spend the afternoon with Nick working at his Teen Nick offices in New York City. So far the star’s opening bid is $500, not to shabby Mr. Mariah Carey. Bidding ends next week Thursday. Also, click on the video above to find out if Nick Cannon was bullied. Taye Diggs, Grey’s Anatomy Chandra Wilson and Good Wife’s Archie Panjabi talk about why they want to Stomp Out Bullying. And the search goes on, and on. 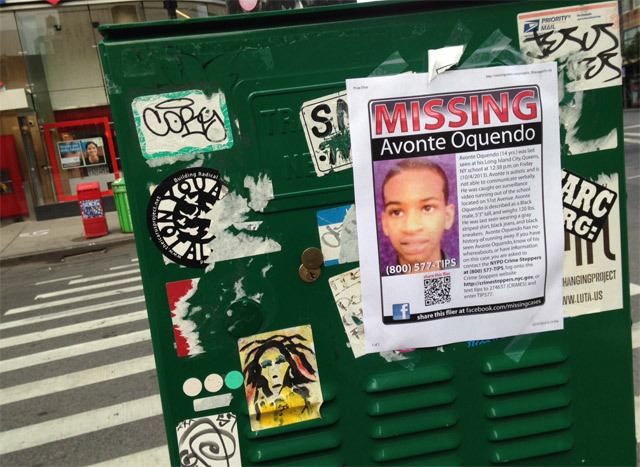 Its been 19 days since Avonte Oquendo has been missing. There has yet to be a trace of his whereabouts. NYC police commissioner Ray Kelly has announced scaling back police and volunteer resources on the search. Meanwhile, Oquendo’s family and Al Sharpton have stepped up the search. The renowned black activist has pledged his own $5,000 reward to anyone who knows the whereabouts of the missing autistic teenager.